Are you an adrenaline junkie? 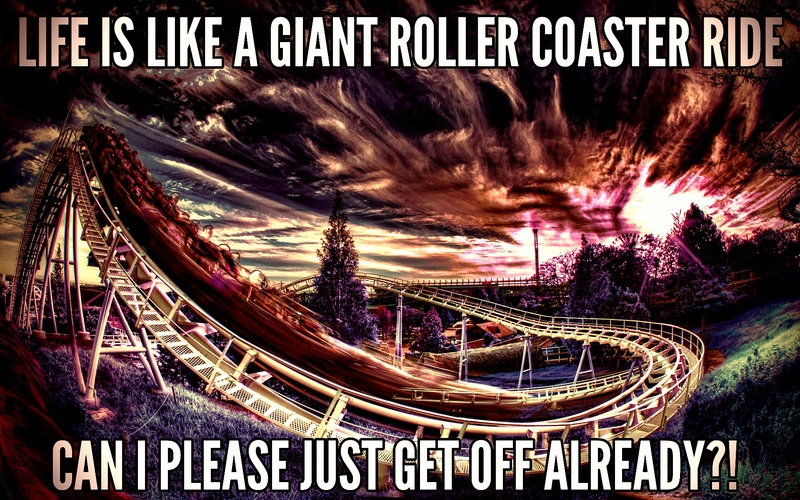 Do you like roller coaster rides? I wouldn’t call myself an adrenaline junkie. However, I do love a good roller coaster ride. The ups are thrilling, the downs are scary. Together, they equal fun. Thinking of roller coasters, I have come to realize that life is quite like a roller coaster ride – one we can’t get off of at will. If you’re anything like me, the thought is initially a good one. However, the ups and downs can be terrifying when you recognize that they are essentially never ending. This is the trap I find myself in at the moment. I just want a breather. I want to do more than just pretend life will ever be any different. The trouble with this, right now, is that I am finding it more and more difficult to grab a hold to those good times – for fear that the crushing and depressing times are just around the next bend. I recognize that it’s a function of embracing the moment – of loving life, right where I am. Truth be told, I do that. And at times, I am not able to. Right now, I find that I am in the part of this eternal ride that is scary and feels almost like the cart will jump the rails, and crash. Sigh. I just want to break the cycle – and I’ve pretty much given up hope of even that possibility. Is it too hard to ask – to just be able to raise my hands, yell with glee as I enjoy the ride? I think it is. I’m not going to lie. I have come to really dislike the familiarity and predictability that the roller coaster ride brings. The highs and the lows – the ups and downs. The emotions and feelings that refuse to give up their grip. So, here I sit – looking for the exit. There has to be one somewhere. So far, I haven’t found that elusive escape route. Please, someone – please tell me this life still has the potential of love, hope, compassion and even freedom. Freedom to just live. For anyone who will point me towards faith, counseling / therapy, talking it out, friends, is any other great coping mechanism – proceed with caution. I do stand on faith, seek help through counseling / therapy, I clearly ramble too much as it is – but I do talk when I can find friends to talk to. See, in theory, a great support system is in place. But, frankly, that system is broken. See my previous post. People sometimes don’t say what they mean, mean what they say – and their actions most certainly don’t match their words. Please don’t be that person. So, as I sit here today, I just pray for the strength to keep going. Taking that a step further – I also pray that I continue to WANT to keep going. My fear, if I’m being honest, is that the voice of depression and grief that clouds my thoughts will grow louder than that of hope. So, for better or for worse, that’s where I am today. Here. Breathing. With my heart still beating. Yes, there’s life yet to live. I hear you, Laura. The constant ups and downs can be exhausting and nauseating. The more I think about it, though, the more I wonder if I’d be willing to shave off the peaks on both ends and just live a predictable, safe existence. Sometimes I think I would, but most of the time I know better. When it gets overwhelming for me, I try and turn it into a game. Sometimes that looks like finding someone whose courage and strength I admire and pretending like I’m them. At other times, I try and find as many people as I know who are going through it too, and reach out to them. In the end, I find that what I hate most about the roller coaster is the feeling that I am trapped on it alone. seemingly never ending ride. The being (or feeling) alone bit – yes, that’s crushing. I just realized something. I play that game too. That alone just dawned on me – as alone or broken as I feel at whatever given time – I’m not alone. Neither are you. And no one has to be.